Short Players To Quit Kotoko? Kumasi Asante Kotoko Football club is on the verge of losing all its "petite de taille" players to other clubs in the forthcoming season. Information reaching me indicates that the behaviour of Hans Kodric, the German coach of the team, towards short players of the club is undesirable.It said talented players like Kojo Poku Jnr, Elvis Opoku, Stephen Oduro, George Yamoah, Joe Louis and others are being sidelined by the German due to their height disadvantage. This, the source said is not good for team building. Some of the skilful but height disadvantaged players interview by me said they will resist any attempt by the management of Kotoko to loan them to any club rather than the clubs of their choice. They indicated that it is unfortunate that the coach is sweeping talents to the background. "We played against all the giant players that the coach is in favour of in the just ended league and came top" fumed one of the players. Most Kotoko fans in Accra interviewed over this issue said it is unacceptable for the coach to sideline midfield gems like Stephen Oduro and Elvis Opoku and go in to try tested defenders like Sammy Addo, Godfred Yeboah and others at their unusual position at this crucial time. They said Ghana has the history of having intelligent but height disadvantaged players who when it comes to decision making on the field carry the whole team on their shoulders.Hear them: "The Osei Kofi's the Sunday Ibrahim's, the Anue Cofie's you name them, were smallish but they did what the strongly built players of their time couldn't do, so what does the coach mean? My observation is that since Hans Kodric took over as the coach of Kotoko he has sidelined all the short players of the club and this act has not gone done well with some of the die-hard supporters of the team. 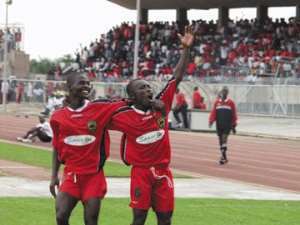 Already, players like Joe Louis and Elvis Opoku, two sensational players of the 2003 Premier League season, who are caught by height problem in Kotoko have declared their intention to play for Accra Hearts of Oak in the forthcoming football season.